1) Combine (A) in a mixing bowl, use a hand whisk to mix till well blended. 3) Combine (C) and sift together, fold into yogurt mixture in 2 – 3 additions with a spatula till just incorporated (stop when see no trace of flour)(do not over mix). 4) Add (D) gently and mix well. 5) Pour into a lined 9”x5” loaf pan and bake in preheat oven at 180C for about 35-40mins or till cooked (baking time should be longer if you use a smaller pan). 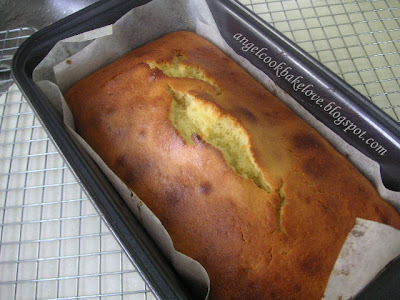 6) Allow cake to cool in pan on a wire rack for 15mins. Gently remove cake from pan and set on rack to cool completely. 7) Combine (E) and stir till icing sugar is dissolved (adjust the sweetness/sourness to your own liking). 8) Prick some holes on cake using toothpick, spoon (E) gently over the cake. Allow it to soak into the cake before next addition. 1) The crust was slightly over-baked and a bit thick, I should have lowered the temperature (which I had forgotten) as black colour mould was used to bake this cake. 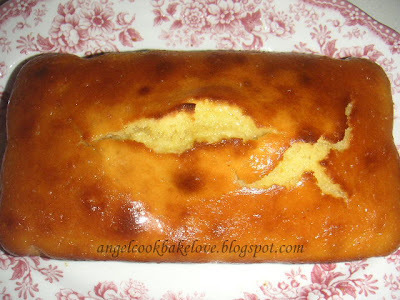 2) Cake is moist with great lemon scent, a bit to the sour side, I used juice from whole lemon for glazing. If you prefer less sour, reduce the amount of lemon juice or increase the amount of icing sugar. Enjoy! U mean u made this cake as well? The most common reason for the crack is because the edge of the cake is cooked faster than the middle, causing a dome and crack on top. I have missed this post earlier. The cake looked good and quite similar with the one that I have baked. You are right, I should have tried the glaze before putting it on the cake. I did not do so, so ended up it is too sour and my husband dislike it. I have a fren that tried the low fat lemon yogurt cake. She told me that why her cake is not fluffy and it turned to be hard? Mind to advice. I think generally men dislike sour stuff, haha. The glaze makes the cake more moist and looks nicer. 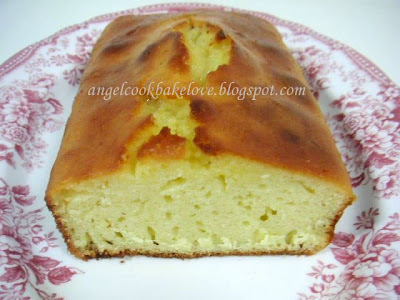 The low fat lemon yogurt cake that your friend made are you refering to this cake? This cake is using 'muffin method' that means just mix wet and dry ingredients together, the cake will turn out to be hard if overmix the batter. This is the only reason I can think of. When mixing the batter, do not stir, instead, use folding method, i.e. fold from bottom to top then use another hand to turn the bowl at the same time. Hope my two cents worth. Thank you so much for your info and reply. I will convey it to my fren. I guess I am lucky that my first attempt in the low fat yogurt lemon cake turned out well...Hehe. You are welcome. Hope that ur friend will get a soft cake on her next attempt. (but do not expect the testure will be as soft as sponge cake or cake made by 'creaming method' because generally cake made by 'muffin method' will be more dense and less fluffy).